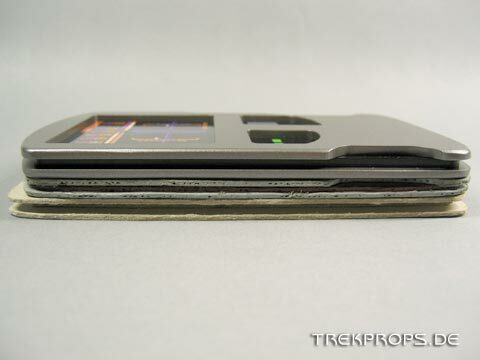 What you see here is a PADD from “Star Trek: Voyager”. To be precise, it’s the smaller one of the two common types from the show – the one that was carried around in nearly every episode. 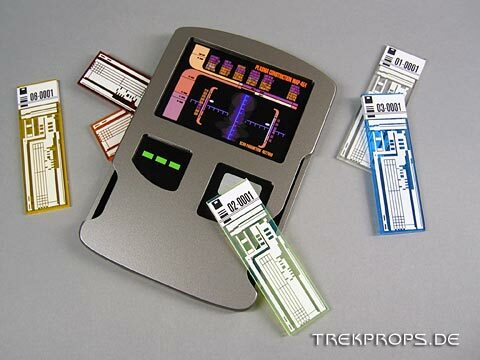 There were times when Janeways desk was completely covered with these. 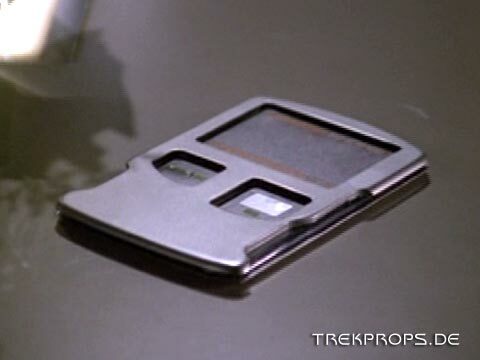 While this is a relative simple and cheap prop to make and – like most of the other props – was cast from resin during production of “Voyager”, the kit of my replica was not made from resin but from laser cut acrylic plates which however have the exact dimensions of the original PADDs. This kit was manufactured by Matt Munson and was beautifully done in terms of research work and precise production. He even did the thickness of the acrylic sheets exactly right! The self-adhesive graphics were also done by him, including a “button” cut from brushed aluminum vinyl. Thanks a lot, Matt! 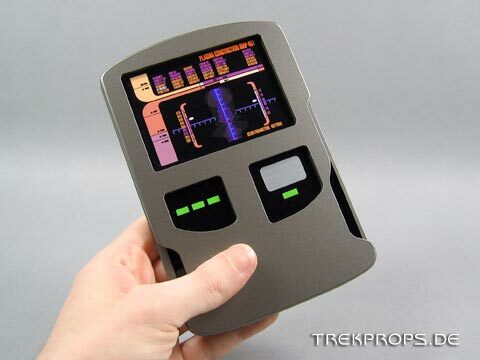 The standard color for modern Starfleet equipment: Plasti-kote 7173. The metallic paint creates a nice and shiny surface. Looks good next to my isolinear chips. 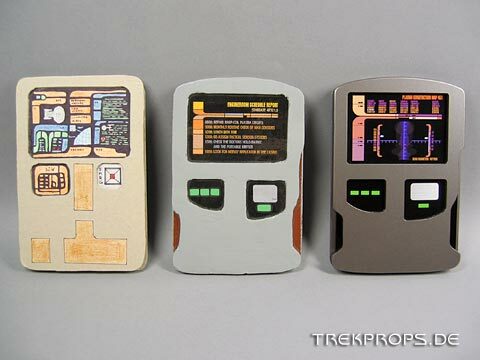 Since PADDs are often used in Star Trek shows and are obviously simple to build, I’ve tried to construct appropriate replicas lots of times before. However, I wasn’t really successful in that until now that I know more of materials and procedures. 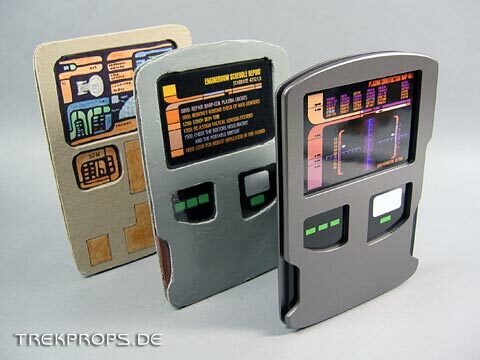 Left: TNG PADD made from thick cardboard and with coloured pencil graphics. Unfortunately, I cannot tell exactly when I did these variants anymore, but as you can see when you look at the colored pencil graphics (first try on the left), I was still a kid! Center: Corrugated board strengthened with putty, printed graphics and tin foil. 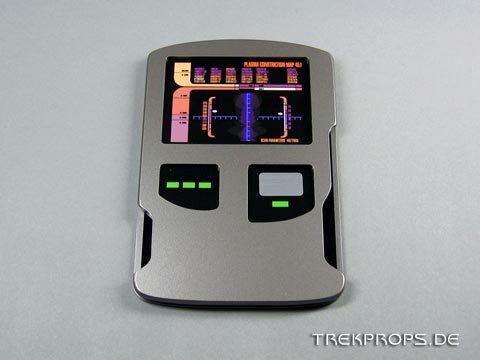 Posted in Prop Showcase, Voyager. 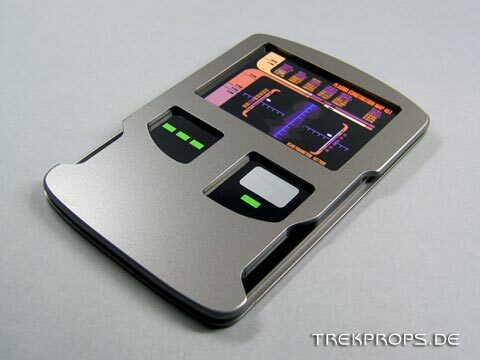 Tags: PADD, Starfleet, Static Prop. Why not make a sleeve to fit over a small tablet. I have one that 3’X4&1/2′. Somebody would have to write an app for it. Even if it only had a moving bar graph, it would look cool.